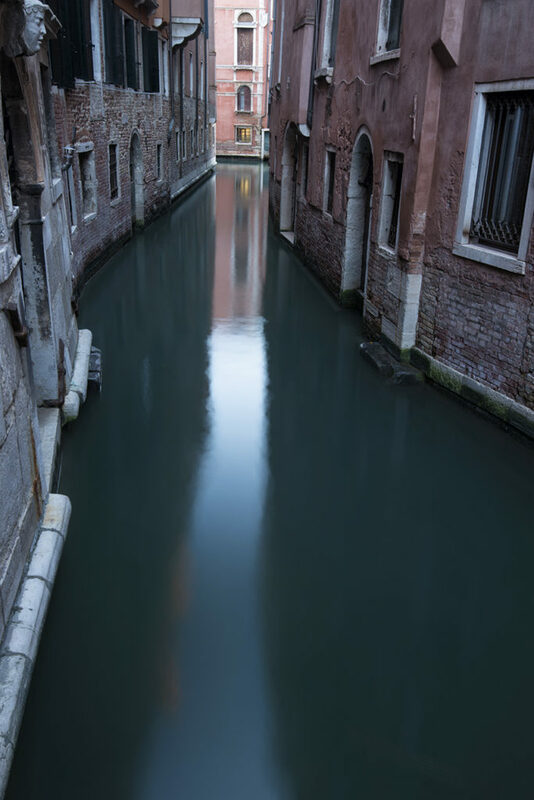 On a recent business trip to northeastern Italy, I was fortunate enough to squeeze in a short daytrip to Venice, en route from my arrival airport in Trieste to my first destination, Udine. While I normally dislike being rushed when I’m photographing, the opportunity to pay my first-ever visit to Venice, though I knew I would be forced to work a break-neck speed, was too good to pass up. A famous cynic, very little impresses me these days. But I have to admit that Venice blew my head off with its incomparable beauty and timeless charm. The city is almost ridiculously beautiful. Several times, during the course of the day, I turned a corner, happened upon an unexpected scene and just had to stop and laugh and shake my head in giddy incredulity at the beauty of what I was looking at. Although I have visited almost a hundred countries and thought I had seen everything, I have never seen any place as picturesque as Venice. Knowing that I would have to work fast and wanting to get the maximum amount of image-making out of my short visit, before arriving, I bought an iPhone app called “Photographer’s Guide to Venice”, which at least helped me to identify the not-to-be missed shots. Of course, there is a risk with an app like this that one might end up doing little more than re-shooting photos that had been shot a million times before. But I found the app invaluable in helping to get quickly from one great photographic location to another. 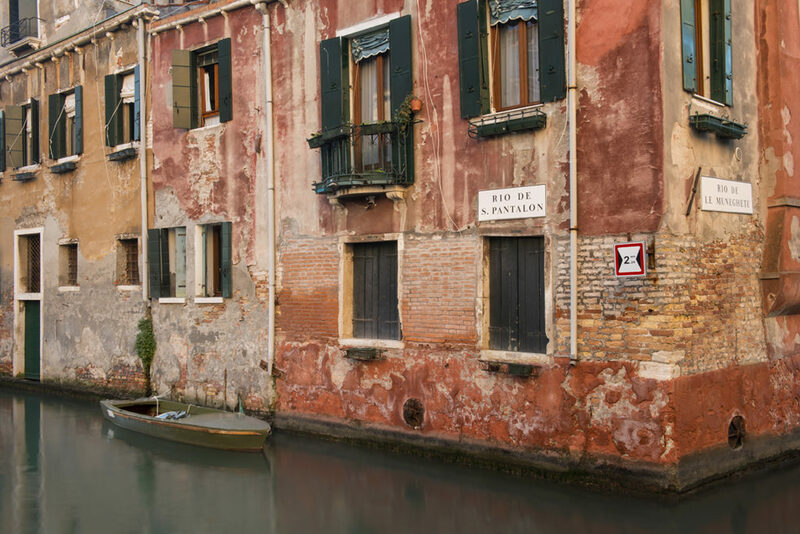 And, although I did shoot some of the iconic Venetian scenes, I happened upon a sufficient number of unexpected locations, just by walking around, that I felt I was able to produce my own interpretation of this much-photographed city. Everyone knows, of course, that Venice is sinking. But what is also apparent, during even the briefest of visits, is that it is also crumbling. The buildings are all several hundred years old; the wear and tear, as well as the fact that most are standing in water, have visibly taken their toll. 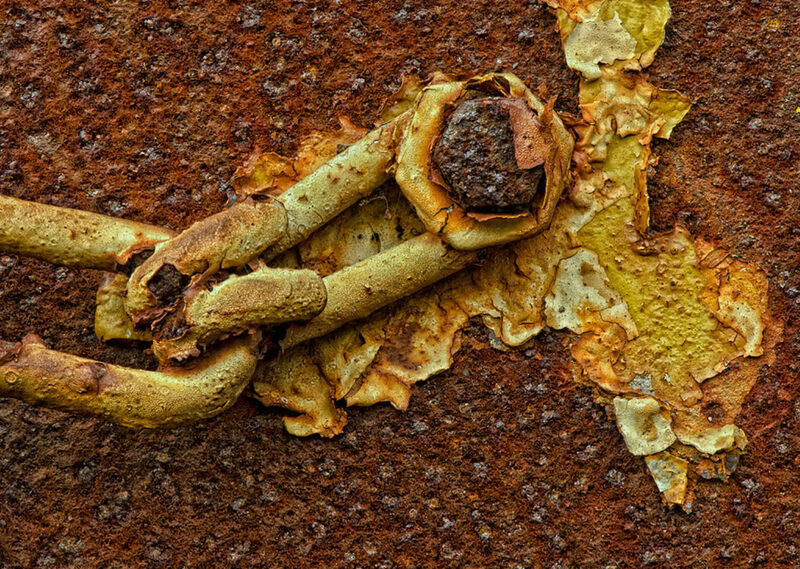 While one gets the feeling of a tragedy that is in the process of happening, from a photographer’s viewpoint, this makes for wonderful combinations of textures and colours. 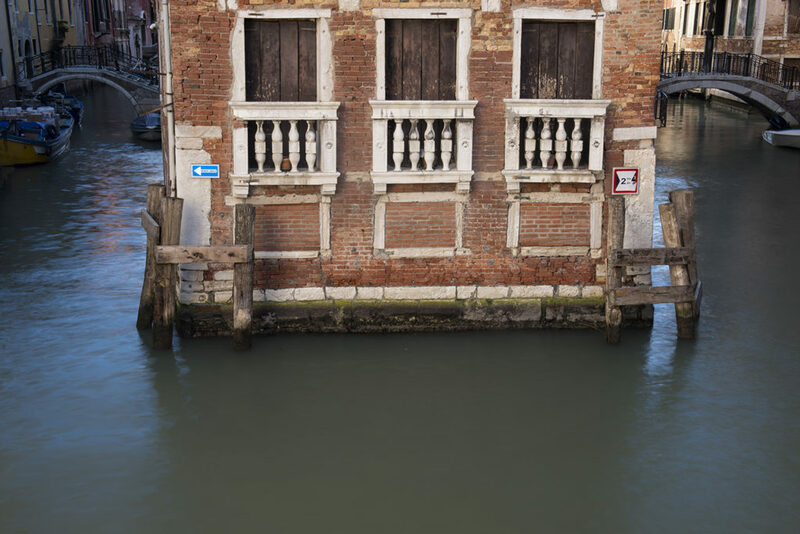 Directly in front of many of the buildings, the owners have driven wooden stakes into the canal bed, to protect the masonry from being damaged by passing boats, as in the third image. I was hugely entertained, at one point in the day, while photographing from a small bridge, to watch a cargo boat trying to navigate around a tight corner. As the sturdy bow of the approaching boat neared the delicate brickwork of a house that stood at the edge of the canal, the owner of the house, an elderly gentleman, flung open his door and stuck out his foot, pushing against the bow of the boat and guiding it around the corner without bumping into his precious masonry. 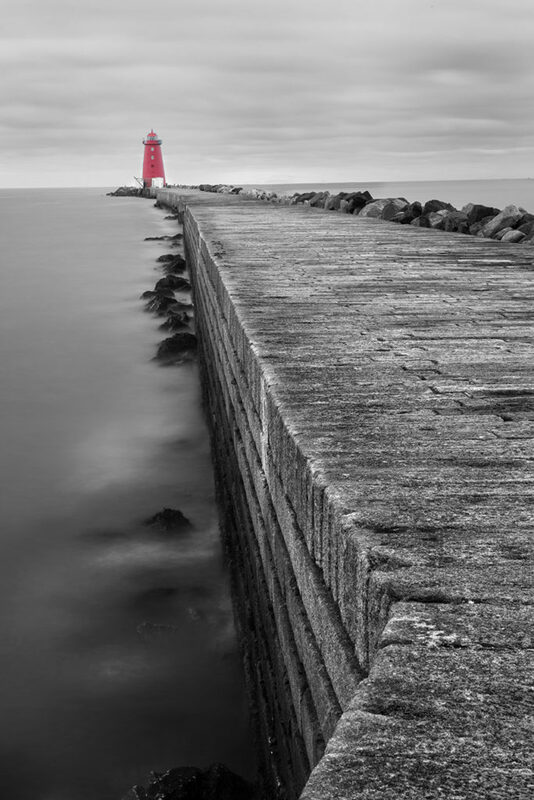 Out in the middle of Dublin Bay, at the end of the South Bull Wall, stands the pretty litte Poolbeg Lighthouse. 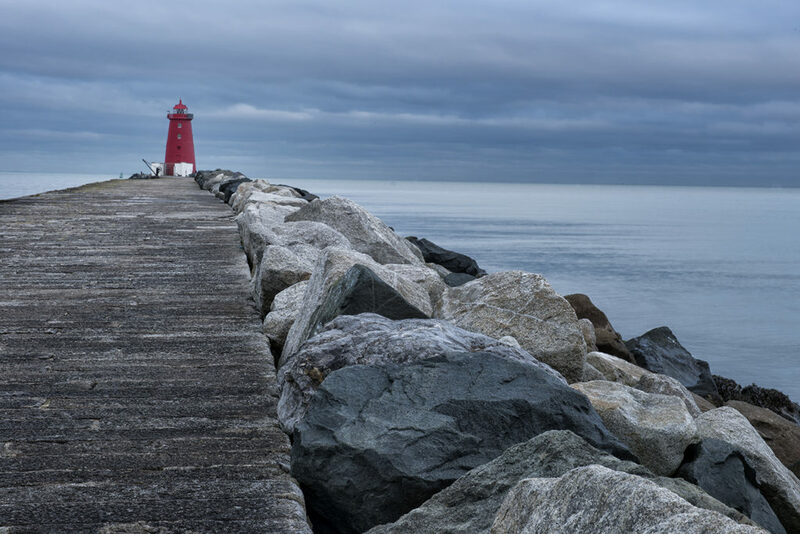 The stone wall was built starting in 1740 to prevent the sands from the beaches on the south side of the bay from filling up the busy shipping channel into the Port of Dublin. In 1768, the lighthouse was added. It was originally operated by candlepower but switched to oil-powered lighting in 1786. 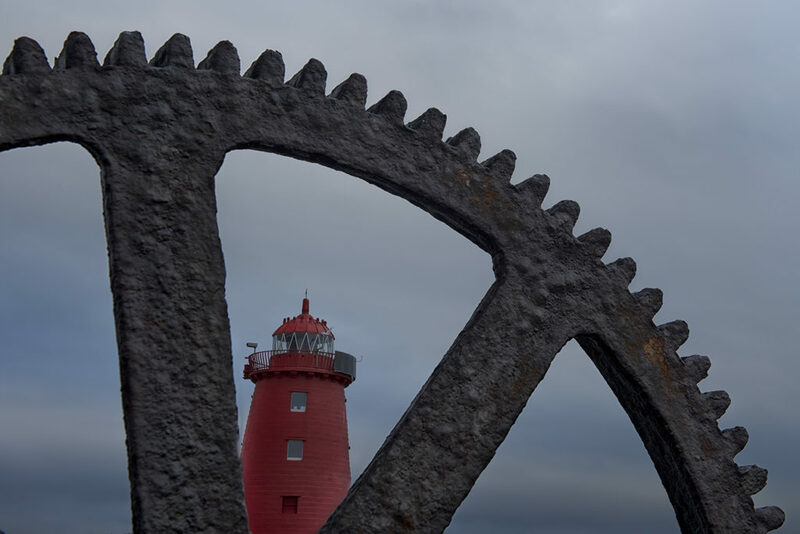 The lighthouse is a popular spot with fishermen and energetic locals in search of a bracing walk: the wind whipping in off the Irish Sea puts up a stiff resistance to walk against. 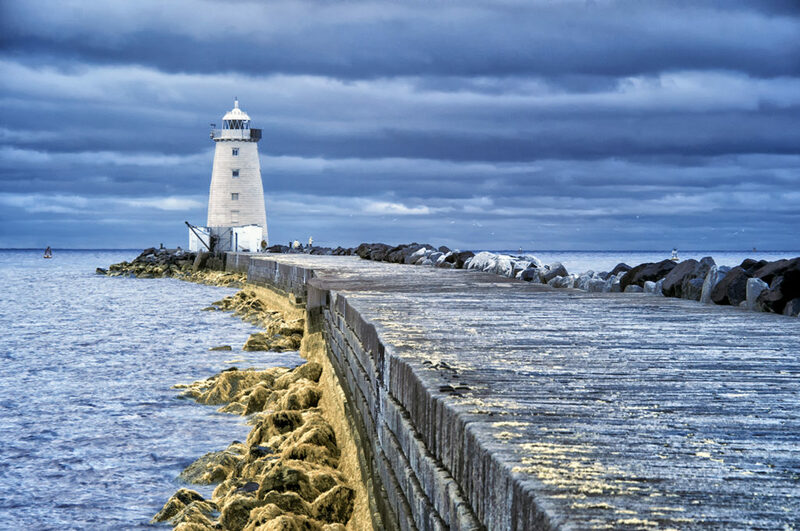 The wall and lighthouse have also starred in several music videos, all of which seem to feature broken-hearted young men setting off on the forlorn walk along the wall in the direction of the lighthouse. The first was Phil Lynott, in the video of his classic song, “Old Town” from 1982, a song which is a long-time favourite of mine. As if to pay homage to the late Lynott, The Script’s lead singer, Danny O’Donoghue, embarked on the same desolate walk in the video to “Breakeven”. 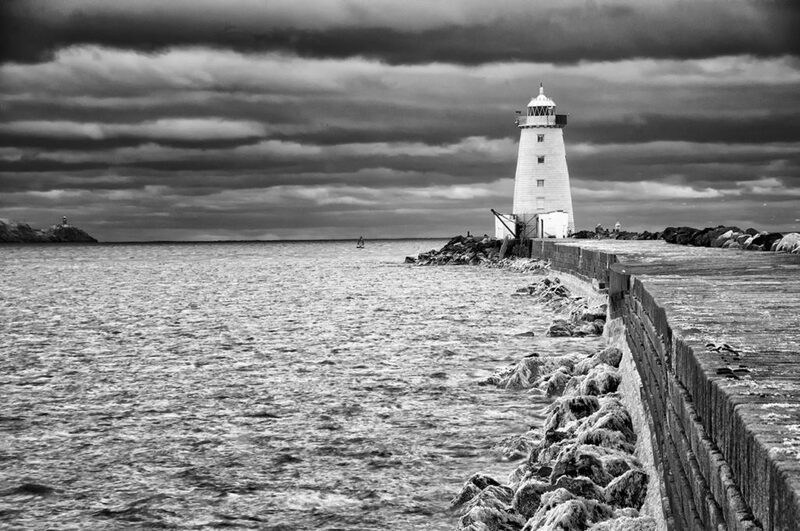 There is something about this spot, about the length of the walk, about the location of the lighthouse out in the middle of the bay, surrounded only by sea and sky, about the often harsh weather conditions, that seems to make this place the very epitome of loneliness. There are images that I carry around in my head, sometimes for years, before I actually create them. This is one such image. I pre-visualized it for two years before I had the opportunity to shoot it. I consider it to be the best photograph I have ever taken. Yet, during those two years when I was visualizing it, I was seeing the wrong image in my head. I had always seen this image in vertical; but it turned out that shooting it in horizontal format produced a much stronger composition. The genesis of this image lies in a thought that Joe Rossbach shared with me: that his favorite time to photograph Great Falls is right after a storm, when river is at its most turbulent. The bigger the storm, the more dramatic the images the falls yield. 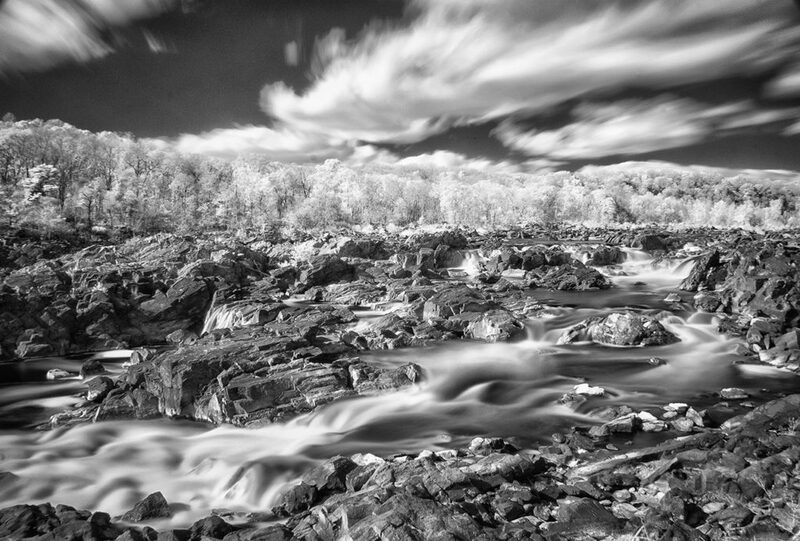 I have photographed Great Falls many times but never got anything like Joe’s majestic images. So, I resolved to get there in the wake of the next major storm to pass through the area. My opportunity came when Hurricane Sandy struck the northeastern United States on 29 October, 2012. I reached the falls at five in the afternoon on the day after Sandy had passed overhead, just as the already subdued light was beginning to fade. As I expected, the river was swollen and angry, a full fifteen feet above its normal level. 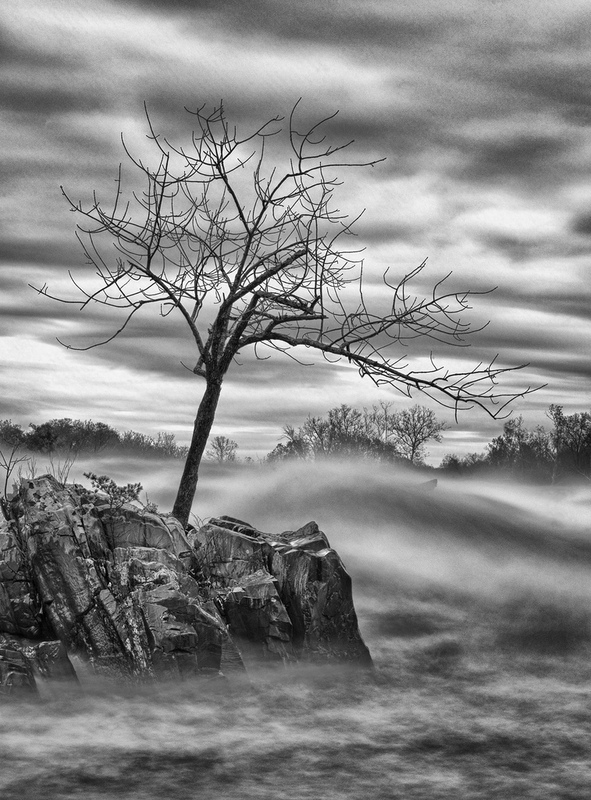 In my previous visits to the Falls, I had noticed this lone tree, growing out of a rocky outcrop close to the river’s edge, its limbs bent over under years of pressure from the wind. I knew that, once the tree was bare of leaves, its branches would form strong graphic lines, upon which I could anchor an effective composition. A key element of the composition that I had foreseen was separating the lower branches of the tree from the tops of the trees on the opposite bank of the river. To achieve this, I spread my tripod flat on the ground, by the water’s edge, and shot upwards into the tree. Given the heavy cloud cover and fading light, I was able to make a single, five-second exposure, which caused the surface of the river to blur, further roiling the already angry surface of the water. I shot thirty-two frames in vertical and, almost as an afterthought, two in horizontal. Checking the images on the LCD screen of my camera, I was thrilled, knowing that I had captured precisely the image I had spent two years contemplating. Yet, when I got home and put the images up on my computer screen, it was immediately obvious to me that the horizontal composition was by far the stronger. It wasn’t even close. Somehow, the horizontal composition just feels more natural, better balanced. I think it’s because, when the eye follows the graphic lines of the tree from left to right, the horizontal frame gives the eye space to move into, circle around the bottom of the image, then work back up the tree. By contrast, with the vertical composition, the eye travels along the lines of the tree, then immediately crashes into the right side of the frame, after which, it has nowhere to go. Nowadays, I always shoot both. I headed out early this afternoon to do some long-exposure photography, experimenting with a B+W 10-stop neutral density (ND) filter. The day was bright, sunny and cold, with strong, gusty winds blowing huge, billowing clouds across an azure sky – perfect for the kind of images I had pre-visualized in my head before stepping out the door. I was thinking about creating images of a rugged landscape, dissected by silky-smooth, flowing water under a dramatic sky, dominated by dreamy, fast-moving clouds. 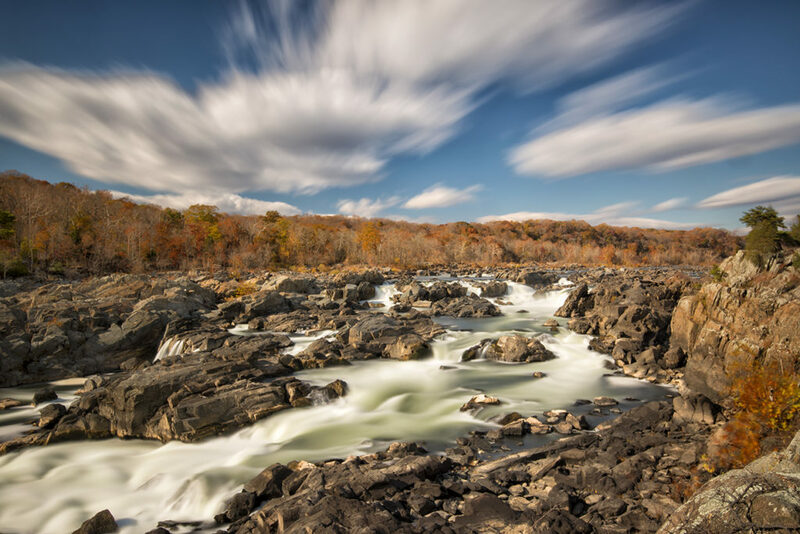 It is fortunate that an ideal location for creating such images lies only about three miles from my home: Great Falls on the Potomac River in Maryland. The 10-stop ND filter enabled me to create such images, even in bright midday sunlight. It’s a dark piece of glass which allows the photographer to keep the camera’s shutter open for far longer than would normally be possible in bright sunlight but without over-exposing the image. 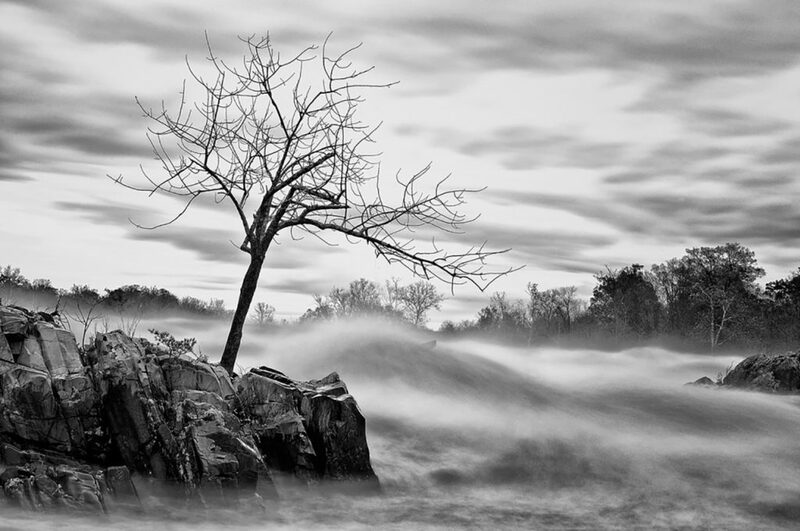 The effect of such a long exposure – the main blog image was 124 seconds – is that movement in clouds and water is captured by the camera’s sensor as motion blur, giving the photographer the power to bend time and lend a surreal look to an image. 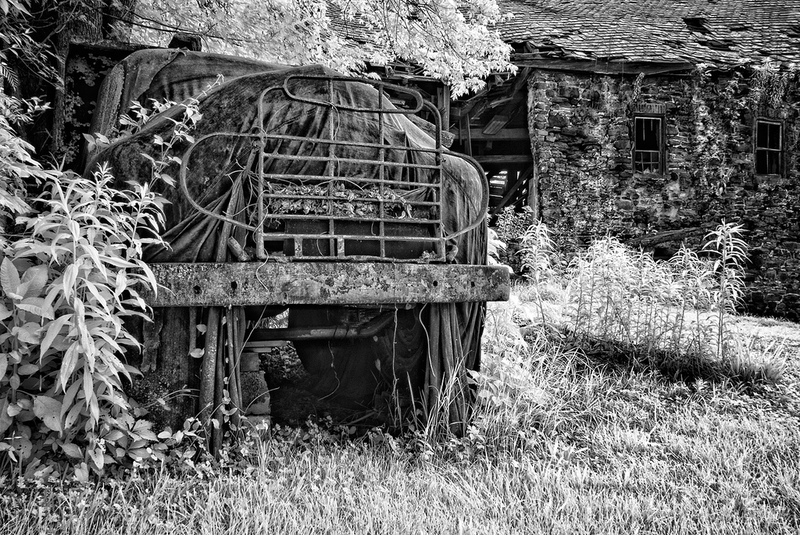 While there are well-established methods for calculating a correct exposure while using a 10-stop filter on a regular camera, getting a correctly-exposed image with an infrared-adjusted camera, as I used for the second and third images, proved to be more a matter of trial and error. This is because the IR camera “sees” through the dark glass of the filter more powerfully than does a regular, visible-light camera. As a result, for the IR images, the shutter was open for only 40 seconds, although the lighting conditions were the same, as were the aperture (f22) and ISO (200). One of my favorite things to do is to get in my car, with my camera gear loaded in the back, and drive. Just drive. Drive out into the countryside and get lost. Purposefully lost. I simply point my car in whatever direction the road seems to be heading, take turns for no other reason than that I like the sound of the road name, and see where it takes me. I often find interesting photographic subjects this way. 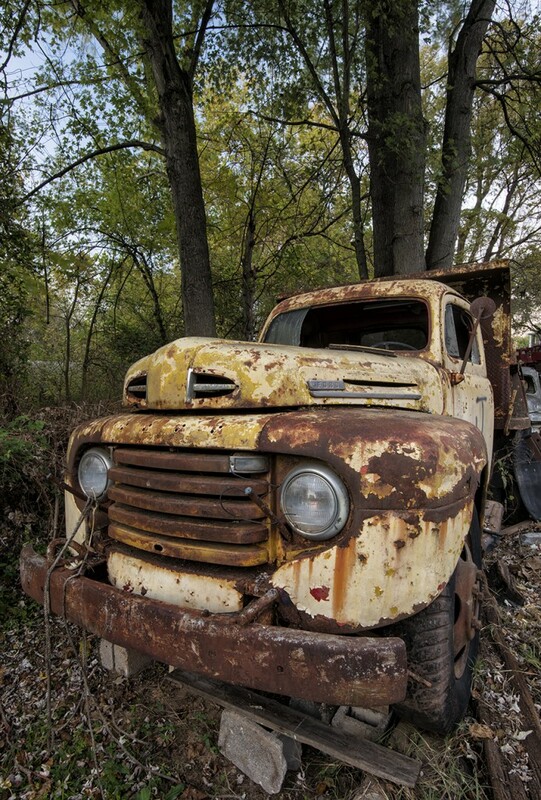 About four years ago, I was driving lost in rural Maryland and spotted this old truck. 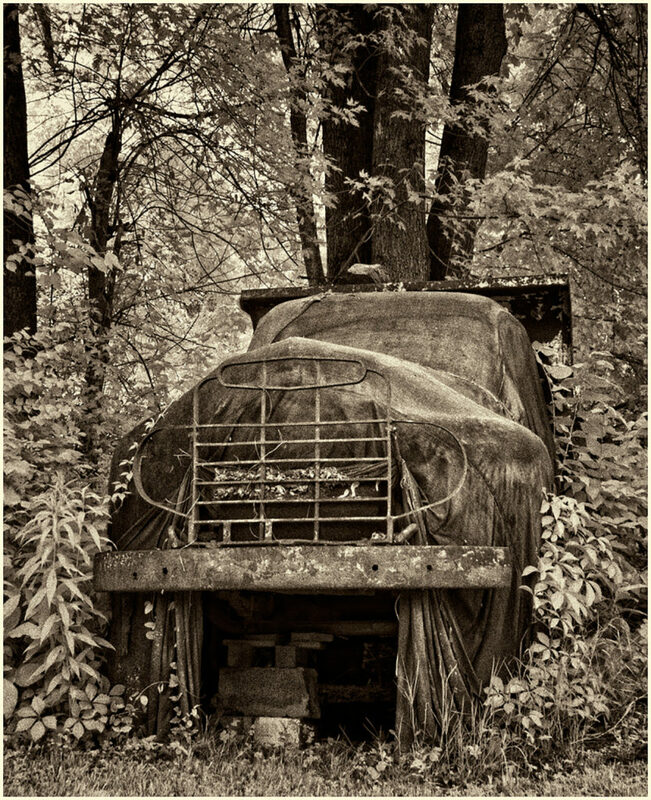 She was parked under a tree beside a country road, with a tarpaulin covering her cab and an outsized grille attached to her front bumper. Although I couldn’t see most of her, she looked like she had been standing there a long time. I pulled over to take a few photos of this sad ghost truck and found nearby a treasure trove of some fifteen abandoned Ford trucks from the 1940s and 50s, all parked within a stone’s throw of a partially collapsed mill that had been built in 1812 by an Irish American named Charles Carroll, who was one of the signatories of the Declaration of Independence. The gods of photography must have been smiling down on me that day. 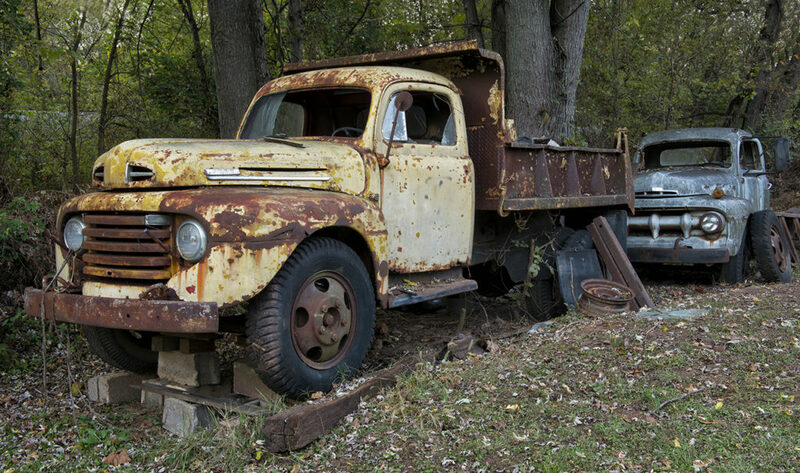 Over the intervening years, I have stopped by this same spot dozens of times and photographed this and the other trucks at different times of day and in different seasons. They always make great subjects and have yielded hundreds of images which delight me. Last weekend, I drove by again and the tarpaulin was gone. So was the grille. And she is yellow! I was thrilled to see her uncovered, to get a good look her, to enjoy her true colour. But, in a strange way, I felt a little embarrassed, as if I had inadvertently walked in on old friend and caught her undressed. I had become so accustomed to photographing her shrouded in her mysterious robe that I wasn’t sure how to go about photographing her, now that I could see her properly. Given how long I had known her, I felt under an obligation to do her justice when photographing her, to show her in her best light. I had to think about which was her best side, which angle would best show off her bright color, contrasted with the dingy rust on her face. Despite the ravages of time, she looked like an elegant, classy lady, undiminished by the embarrassment of her sorry state.